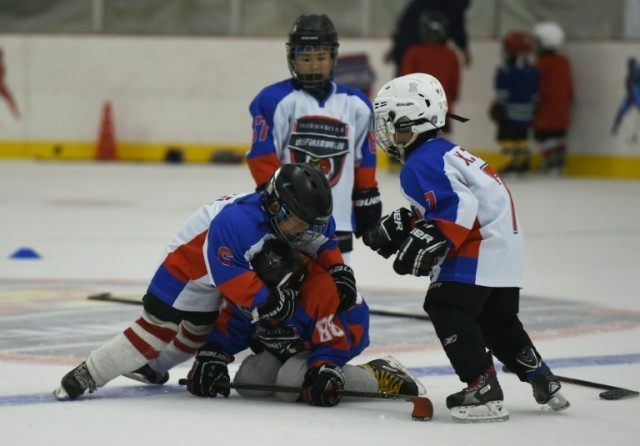 Los Angeles (AFP) – As the battle for ice hockey’s Stanley Cup heats up, a crop of young Chinese players have their eyes firmly fixed on a more distant prize: the 2022 Winter Olympics. NHL draft pick Song Andong and national under-18 teammate Zhong Wei are part of a new wave of Chinese hockey players being groomed for Beijing in six years’ time. Last June, the teenaged Song was selected in the sixth round of the 2015 entry draft by the New York Islanders, making him the first Chinese player to be drafted in the history of the NHL. “It was very cool to get drafted. I am very honoured,” Song told AFP. “I want to use this as an opportunity to grow hockey in China. If I can get drafted then others can. Song, who goes by the nickname Misha, is just one of a talented group of Chinese teenagers who are scattered among high school and junior leagues across North America which the country’s ice hockey leaders hopes will provide the base for a future national team. The 1.8 metre, 82 kilogramme Song just finished playing as a post graduate student at the Phillips Andover Academy school which competes in the Massachusetts high school league. “I had no idea Misha was going to get drafted,” said Zhong, a forward with the Chicago Mission 18-under AAA team. Song captained China at the 2015 International Ice Hockey Federation’s Division II B under-18 world championships and could play for China’s under-20 team at this year’s Division II B world championships. Like Song, who moved to Canada from China when he was nine, Zhong started playing hockey at a young age in Beijing before moving to North America. Zhong said he started playing hockey because he liked the speed and physical side of the game. “My parents would take me to the rink in Beijing every week where I took skating lessons,” Zhong said. He eventually visited another Beijing rink where a resident coach took a liking to him. “One of the coaches saw me skating and he kept yelling at me. Telling me to do this and do that. I started taking lessons from him. He really helped me. I still take lessons from him when I go home,” Zhong said. Zhong’s family eventually moved to the US. The biggest adjustment was coping with the culture shock which included learning a new language and strange foods. “I remember the first day of school. I was sitting there and I had no idea what was going on. I was just so confused,” Zhong said. He said hockey was his escape and sanctuary that helped smooth the culture gap. “We got in touch with a local club and they let me try out,” Zhong said. “I thought I fit in with the team really well. Song, who wasn’t ranked among the top 210 North American skaters by the NHL’s Central Scouting department, was a surprise pick by the Islanders who are owned by the Shanghai-born Charles Wang. Song’s selection by the Islanders raised a few eyebrows as he was chosen ahead of a US national team player and some major junior players but he is hoping to show the Islanders that one day he will fit into their organization. Song says being drafted will motivate him to keep improving his skills. Paul Tortorella, varsity hockey coach for Song’s Phillips Academy team, said his biggest asset is his skating. Song is hoping to play junior hockey next season in the British Columbia Hockey League as a 20-year-old. From there the goal is to play college hockey.